The panacea ash bucket with shovel keeps your fireplace clear of ashes. This generous bucket holds plenty of ash from past fires, and the included shovel makes cleanup simple. 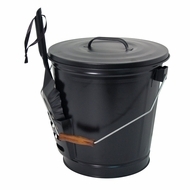 A specifically designed pocket on the side of the bucket holds the shovel, for an all in one unit, and the included lid keeps ash from spilling onto the floor. A sturdy metal handle offers an easy way to carry the item, and a wooden grip at the top keeps it comfortable. The matte black color blends with virtually any surrounding, for an inconspicuous vessel. Store your fireplace ashes easily with this ash bucket with shovel. Available in black color. Measures for shovel dimensions is 14.25-inch length by 4.5-inch width and bucket dimensions is 12.5-inch diameter by 13-inch height.